The RK_300FT_MODULES are replacement modules for the MirC and MirX modules. The The modules will ship as a married pair and should be used to replace the modules that shipped with boards. 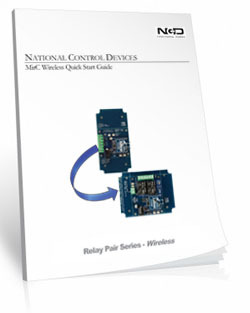 MirC boards operate reliably and efficiently when the antennas can “see“ each other. Obstructions like walls, buildings and even trees and hills can diminish the signal or prevent communication altogether. Metal being the worst for any wireless signal to penetrate with stone and brick and being a close second. Positioning the antennas for line-of-site operation will greatly increase reliability. You have your choice of three modules that can be installed on the boards. The modules installed will affect the range or distance the boards will be able to effectively communicate with each other. This pair is the "Standard Range" modules which operates up to 300 feet (91 m) and includes a small integrated antenna that cannot be moved or positioned. 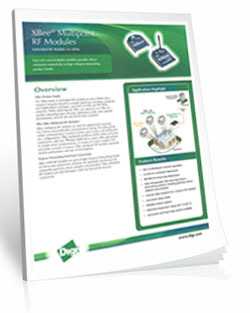 The wireless modules installed use an 802.15.4 topologies, XBee RF modules are ideal for applications requiring low latency and predictable communication timing providing quick, robust communication in point-to-point configurations. The 300' modules operate at 2.4 GHz frequency band. As with any wireless technologies, for optimal performance it needs to be line-of-sight. We can't stress this enough. In other words the antennas of the boards must "see" each other to get the optimal range or even be able to communicate at all. Obstructions like walls, buildings and even trees and hills can diminish the signal or prevent communication altogether. Metal being the worst for any wireless signal to penetrate with stone, brick and hills being a close second. 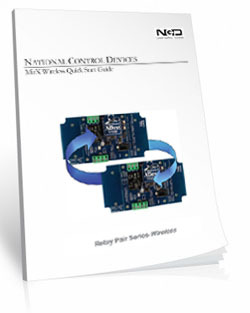 Multiple pairs of the MirC Controllers can be used within range of each other. The boards are paired together using the serial numbers of the wireless modules installed, meaning multiple pairs will not interfere with each other!